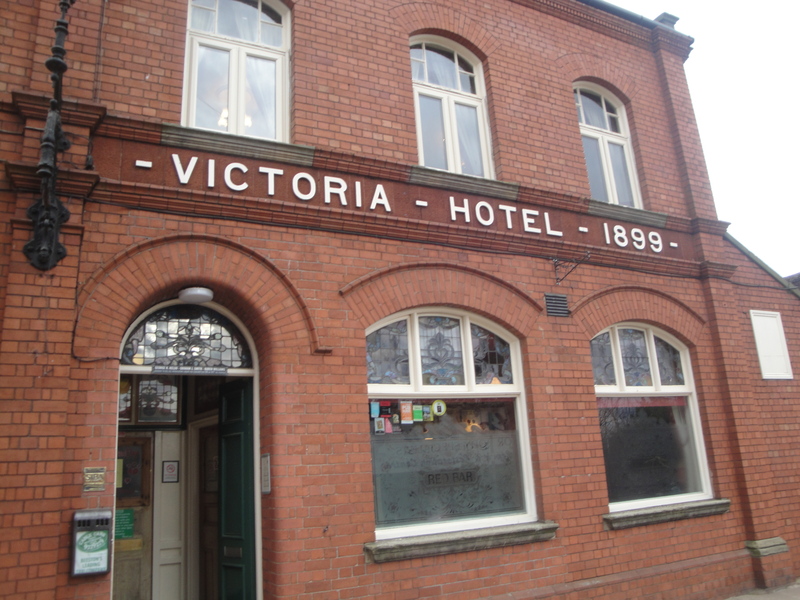 The Victoria Inn in Beeston is located right alongside the railway tracks adjoining Beeston railway station. It is a well known locally both for its food and for it’s beers. They describe themselves as “not a resturant with a bar, nor a gastropub, we are proud to be a traditional pub with great food”. We took the train over here from Nottingham to Beeston, firstly for some food, and secondly as the starting point to visit some of the pubs in Beeston on the ‘Route to Real Ale’. More about the beer in a later post, this one is just all about the food. Inside the main bar is a big set of chalk boards with the daily specials, although they say that they are not a gastro-pub, the descriptions are very much in that style. You can eat in the bar, but they do also have a small dining area as well that you can eat in. We got hold of a couple of pints and pointificated over the menu. It was hard work. There was so much to choose from that we had practically drunk a pint of Harvest Pale before deciding what to eat. 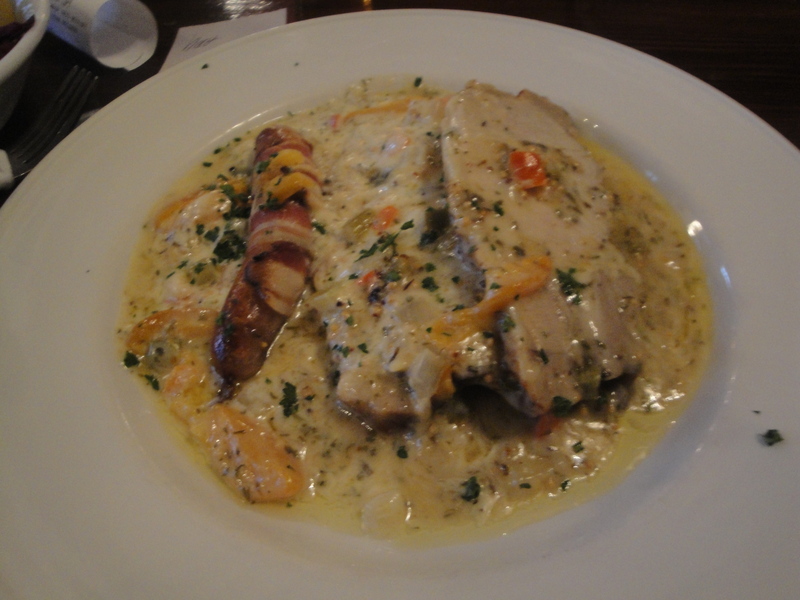 I ordered the “Pork loin steaks in traditional Orchard Pig Cider cream sauce, with apricots, peppers, grain mustard and sage.” for £10.95. On first inspection that might seem a strange combination but it actually worked really well. It came with a bacon wrapped sausage, and a side bowl of mashed potato and seasonal vegetables which included carrots, broccoli, red cabbage, and some boiled potatoes too. I liked the very tasty bacon wrapped sausage, it could really have been a little starter, I am not sure what it’s role was on the plate. I like to think that it was there for those people who were wavering over the apricot component. There were two large pieces of pork which were really quite tender, I really liked the sauce as well. The combination of the slight sweetness from the apricots and the slight bitterness of the sage worked well to counter the richness of the creamy sauce. You had the classic pork and apple combination of flavour with the addition of the orchard pig cider which ran through the dish. The apricot segments were in themselves a hidden treasure in the dish. I found myself alternating between sweet and savoury mouthfuls, a little piece of pork with an apricot slice, then a piece of pork with some mash and shallots. This was a really well thought out combination and one that I may not have thought of myself. On my return I consulted with one of my favourite guides “The Flavor Thesaurus: A Compendium of Pairings, Recipes and Ideas for the Creative Cook” by Niki Degnit, she has the combinations of pork and apple, pork and sage, and pork and apricot all described as classic flavour combinations. She didn’t have all of them together though, someone at the Victoria had worked out that this would work as a dish and I for one am glad that they did. 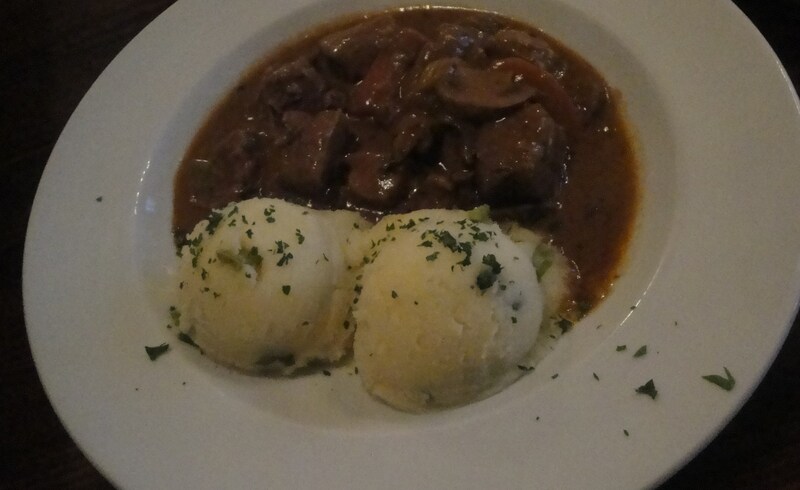 My lunching companion had the “Braised peppered beef in Czech Budvar with Horseradish, shallots, mushrooms and thyme, served with creamy mashed potatoes and a pot of fresh vegetables”, also for £10.95. The pot was the same for all the dishes filled with carrots, broccoli, red cabbage, and some boiled potatoes. I was not able to get my hands on any of this dish, but I was informed that it was really excellent and that the meat was very tender falling apart in a melt in your mouth kind of way. I did taste the gravy at the end and it was nice, I wish that I had had some of the rest of the dish too. Having said that I did not share any of my pork dish so fair enough. The menu can change quite a bit on a daily basis but to get a pretty good idea of what they offer you can view a sample menu on their website. It looks very similar in breadth of offerings that we were privy but it was clear when comparing that they do like to add new options and tweak the dishes depending on what ingredients may be available at that time of year.